Driverless car navigation; AI speeds up cancer research; easier drone navigation. 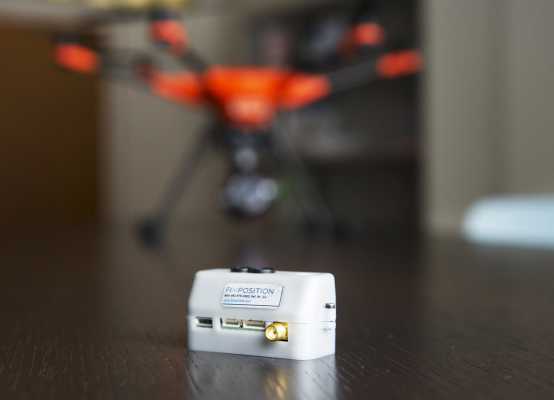 Based on technology developed by ETH Zurich researchers, Fixposition is a spin-off specializing in real-time navigation systems for use in self-driving vehicles, robots or industrial drones, which uses a combination of satellite-based positioning systems such as GPS with computer vision technologies to achieve an unparalleled degree of precision. Lukas Meier and Zhenzhong Su have big plans for a little device. The revolutionary aspect is that localization is even possible in obstructed environments with a weak GPS signal, such as among high-rise buildings in cities, in forests or even underground. To make the system work, Su and Meier combine the advantages of cutting-edge satellite navigation with advanced computer vision technology. Or to put it another way: even with limited signal reception, the car, drone or robot can still operate by visually scanning the environment and checking it for recognizable details. “That’s exactly how our eyes work as well,” Su says. 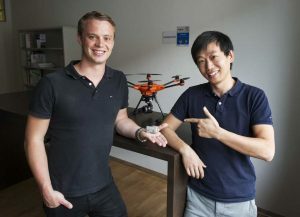 To survive as a start-up, the company founders have decided to concentrate on drones for the time being as drones are no longer marketed purely as toys, but are increasingly being used for industrial applications. The team estimates the value of the global market for commercially used drones that Fixposition wants to break into is approximately three billion Swiss francs. The positioning system of Fixposition is only as big as a matchbox. Drones are currently being used in industry for tasks such as autonomous inspection or monitoring of installations, delivering goods or spraying pesticides on crops. Interestingly in China, drones are also being used in a way that is still fairly unheard of in the west: light shows in place of traditional fireworks. China is not only a crucial market for Fixposition because so many companies are located there that need drones with high-precision navigation systems: the world’s biggest drone manufacturers are based there as well. Fixposition has already signed a partnership agreement with one of them. Thanks to a new AI system developed by University of Cambridge researchers, searching through the mountains of published cancer research could be made easier for scientists. The system, LION LBD, was designed to assist scientists in the search for cancer-related discoveries. The system was developed in response to the fact that global cancer research attracts massive amounts of funding worldwide, and the scientific literature is now so huge that researchers are struggling to keep up with it: critical hypothesis-generating evidence is now often discovered long after it was published. The researchers noted that the ‘LBD’ in LION LBD stands for Literature-Based Discovery, a concept developed in the 1980s which seeks to make new discoveries by combing pieces of information from disconnected sources. The key idea behind the original version of LBD is that concepts that are never explicitly linked in the literature may be indirectly linked through intermediate concepts. The team explained that LION LBD is the first system developed specifically for the needs of cancer research, with a particular focus on the molecular biology of cancer. It uses state-of-the-art machine learning and natural language processing techniques, in order to detect references to the hallmarks of cancer in the text. Evaluations of the system have demonstrated its ability to identify undiscovered links and to rank relevant concepts highly among potential connections. Thanks to Purdue University researchers, drone operators struggling to fly the multi-propeller device and take pictures simultaneously could soon have a much simpler method to steering flight. 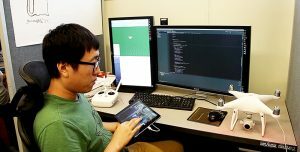 Bedrich Benes, a professor of computer graphics technology, and doctoral student Hao Kang said they collaborated with corporate researchers to develop a touch-screen method to navigate and take pictures with drones. The method, called FlyCam, works with the concept of combining the drone and the camera movements. 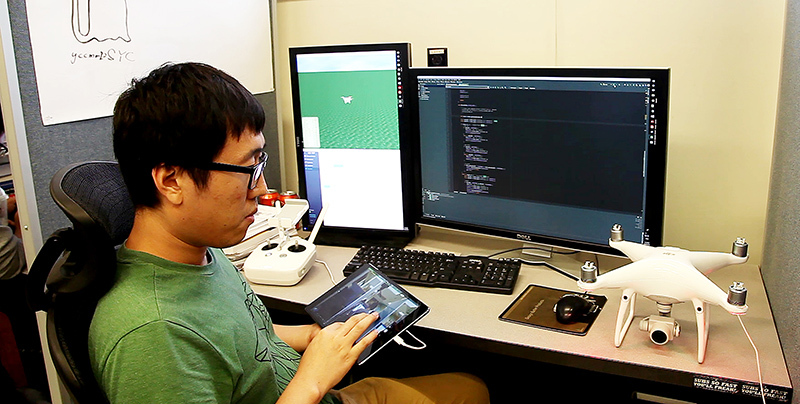 Hao Kang, doctoral student and co-investigator for FlyCam, works on the touch-screen navigation system. Benes said the user doesn’t have to think about multiple controls for the drone and the camera, and can think about the drone as a simple three-dimensional flying camera that is being controlled by simple gestures on a touch-screen device.